Baccarat has one of the best margins for the player in the Casino. Worth learning! Blackjack is the game that’ll give you the best return against the casino. Caribbean Stud Poker is easy to play and good fun, enjoy it in demo here! 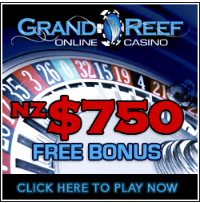 Casino Hold ‘Em is fast becoming one of the most populat casino card games. Cleopatra is a classic IGT slot that has been popular for years and years. Craps is a dice game that gets many player confused, Best to practice it here! Gonzo’s Quest was one of the first 3D slots that truly impressed us. Incredible Hulk is a Playtech/Marvel Slot that is linked to a progressive jackpot. King Kong is a great fun slot and can provide some of the biggest wins online. Reel Gems is made by Microgaming and has hold reel functionality. Robin Hood is a Slot by Net Ent with a nice shifting reel functionality . Thunderstruck II is a favourite slot of ours here at Online Casinos NZ. Where’s the Gold is an Aristrocrat Classic Slot that has been popular for years.